Katie, Steevenson and I decided to give Betsy Baker’s strawberry cake recipe a whirl yesterday afternoon. 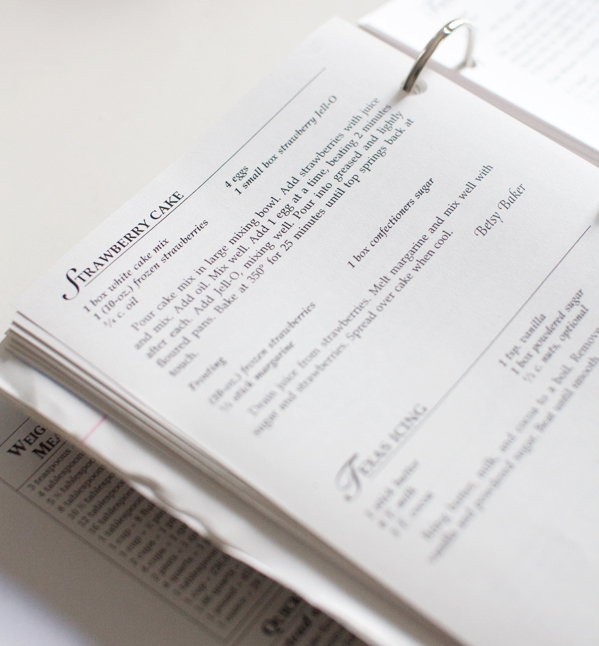 Katie said she hadn’t ever met a Betsy Baker down at First Baptist church, but we found her strawberry cake recipe in the same ‘First Family Favorites‘ cook book that features a handful of Katie’s recipes too. 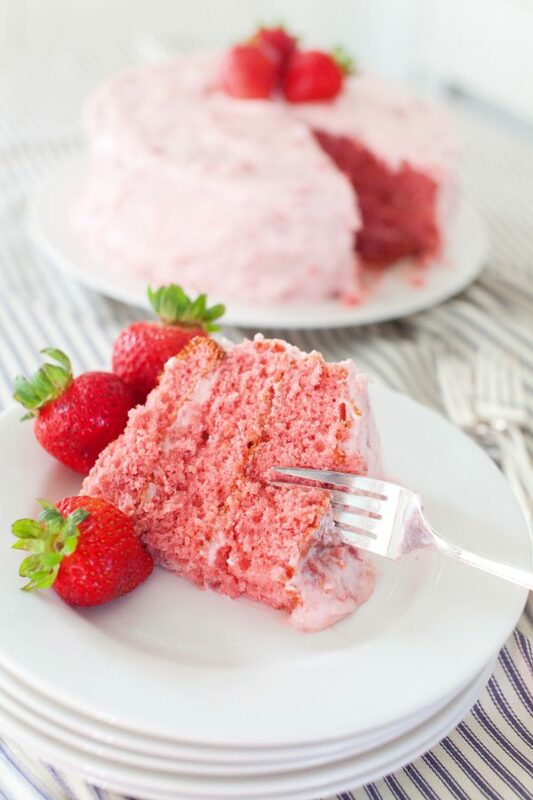 It’s almost bedtime here now so I need to make the short and sweet (no pun intended), but if you’re reading this in the morning or on a weekend, do yourself a favor and make this strawberry cake. Go preheat the oven now. Seriously. 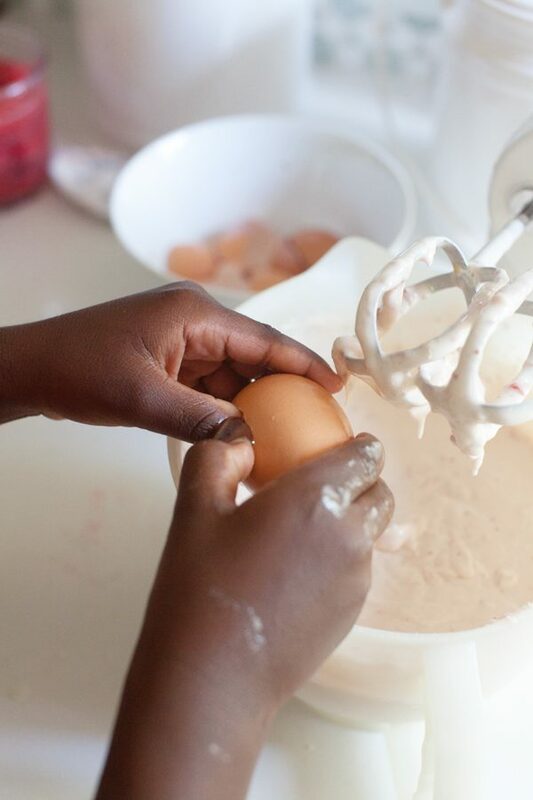 Have any yummy recipes to share? By all means, holler in the comment section if so! Cake: Pour cake mix in large mixing bowl. Add strawberries with juice and mix. Add oil. Add 1 egg at a time, beating 2 minutes after each. Add Jell-O, mixing well. Pour into greased and lightly floured pans. Bake at 350 degrees for 25 minutes until top springs back at touch. 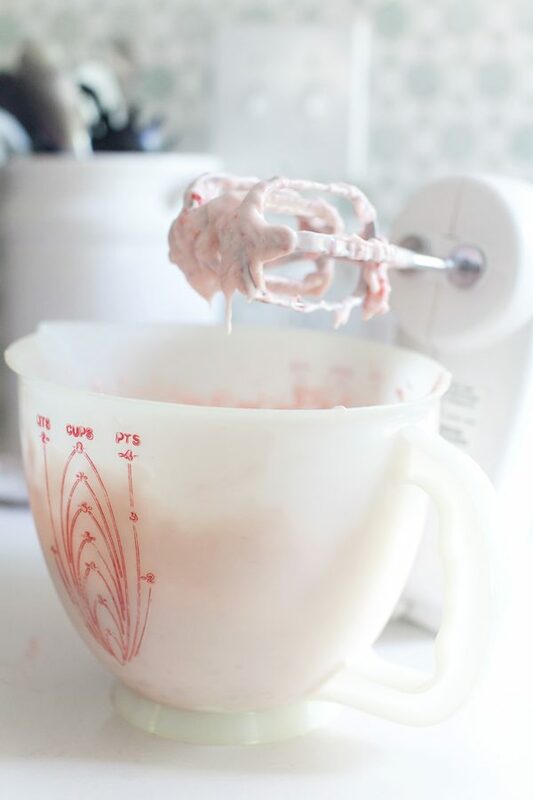 Frosting: Drain juice from strawberries. Melt butter and mix well with sugar and strawberries. Spread over cake when cool. AS much as I love fellowship and baking i would not make or let my family eat this ! Way to much oil & butter … seriously way to much sugar also! To each his own I guess ! Enjoy not making or serving this cake. Thanks for telling us why because we all wanted to know! Just keeping it real …That is why 50 % of children have diabetes and obesity! This is how it starts! By occasionally eating a piece of Grandmé’s cake? I doubt it. 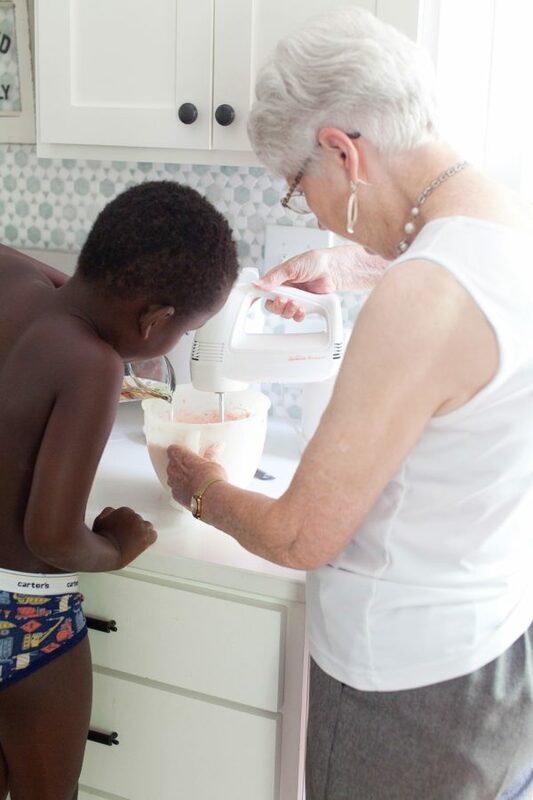 We rarely indulge in a sugary treat but we’ll cherish the memory of making that strawberry cake with Katie forever. How many cake pans does this recipe make? It looks like 3? We used 3, but Katie says you can also do it in a 9×13 pan. Ha, love the undies!!!! Will be making this tonight!!!! I don’t think this is something they’re having for dinner every night. Moderation is key and there’s nothing wrong with a treat every now and then. I LOVE making this cake!! So super simple & so summery! My BIL actually requested it for Fathers Day this year. Says it’s the BEST strawberry cake he’s ever had?? I make mine in a 9 x 12 pan for simplicity. Frozen strawberries are the best because they are picked when ripe and you don’t have to pick through fresh strawberries to find the perfectly ripe ones!! I ADORE that Stevenson is in his little undies! Made plenty of cakes/treats in mine with my mom!! And that Pyrex bowl?? We had the same one for YEARS & YEARS! Super seeet memories! 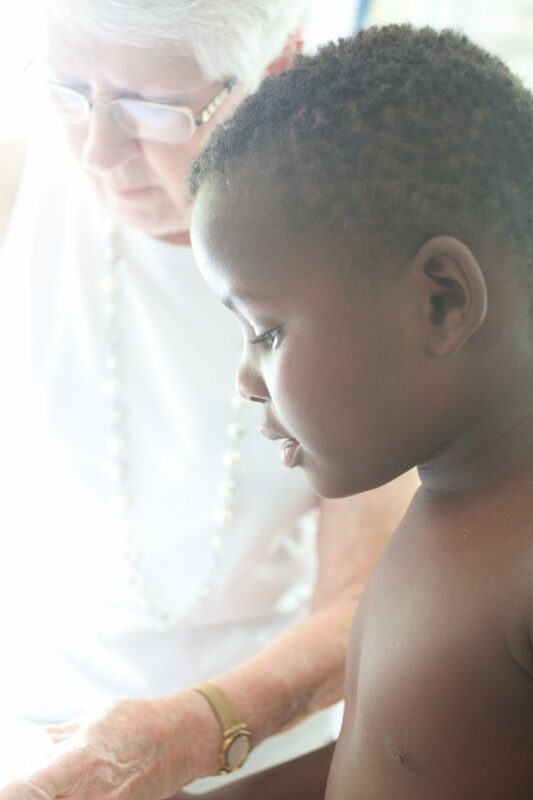 I would have LOVED having my grandparents right next door (literally through FB the door!) Love that you shared such a sweet memory with us! Looks so great! I have to try it (maybe when it is not too hot here in Michigan to turn on the oven!) Do you think fresh strawberries would work since they are in season? Thanks for sharing! Saw the Instagram story this morning! Loved it. This cake is just so beautiful to LOOK at! I’ll have to figure out how to make it gluten free. There’s a great cake mix I think I can substitute. Now, can Stevenson please come over to help me crack the eggs? You can video us as we bake together. Do you add the water to the jello first or Just use the powder? Thank you for this recipe. Made it today for Christmas. Everyone loved it! We have a deli here that makes a really good strawberry cake. Everyone said it was so much better than their cake! Will defiently make again.